After spending the past two seasons backing up record-setting teammate Chandler Harnish, quarterback Jordan Lynch showed that he plans a seamless transition into the starting role as he threw for 402 yards on 29-of-44 passing with four touchdowns Saturday at Huskie Stadium in Northern Illinois’ Red-White Spring Football Game. Lynch led the Red team, composed of the Huskie starting units on offense and defense, to a 31-6 victory over the White team in the final spring football practice of 2012. 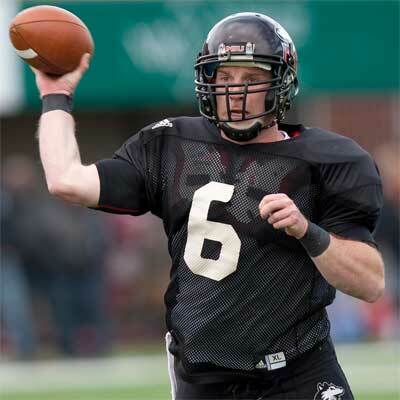 NIU head coach Dave Doeren, who led the Huskies to an 11-3 record and the school’s first Mid-American Conference Championship in 28 years in 2011, said Lynch progressed over the spring and on Saturday as he takes over the offense for 2012. “I think you’ll see a lot of things where he doesn’t miss a step,” Doeren said. “As a runner, he’s probably better [than Chandler]. We didn’t let him run today, which is a big part of what he does. It kind of hindered the play-calling for the coordinator when you’re telling him [Offensive Coordinator Mike Dunbar] he’s not allowed to run the quarterback. “Jordan threw the ball extremely well and threw some really nice deep balls. He hit Luke Eakes in stride on the wheel route. He hit Akeem [Daniels] in a tight window down the sideline. He threw a back shoulder fade to Martel [Moore]. I think the questions people had about his arm strength were answered very quickly today. While attention this spring has focused in on what, and who, the Huskies lost on offense, Lynch and his teammates looked like veterans with three first-quarter touchdowns. The Red team scored on each of its first three drives of the game as Lynch hit running back Leighton Settle over the middle for an 11-yard score to open the scoring, connected with Martel Moore in the corner of the endzone for a four-yard TD, and then lofted a perfect pass to tight end Eakes down the sideline for a 60-yard touchdown. Eakes finished the day with three catches for 77 yards, Moore grabbed four passes for 18 yards and Settle added four catches for 13 to his two rushes for five yards. Perez Ashford had three grabs for 54 yards in the game before sitting out, along with Moore, in the second half. Tommylee Lewis, who played the entire game, led all receivers with seven catches for 98 yards. 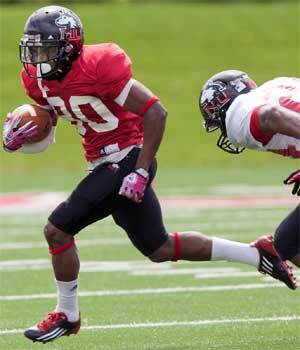 Jamison Wells took a break from his duties with the Huskie baseball team to catch three passes for 31 yards. Tight ends Tim Semisch and Kevin Tennenbaum also had productive days with Semisch catching a pair of passes for 30 yards and Tennenbaum leading the White team with three grabs for 37 yards. Doeren said the Huskies’ offensive arsenal was on display Saturday and throughout the spring. Akeem Daniels led the NIU running backs with nine carries for 29 yards, and added the Red team’s final touchdown of the day in the fourth quarter on a 75-yard catch. Second-team quarterback Matt McIntosh ran eight times for 18 yards for the White squad. He completed seven-of-21 passes for 44 yards against the Huskies’ first team defense. The Red defense gave up a pair of second-quarter field goals as Tyler Wedel hit from 32- and 41- yards, but did not surrender a touchdown in the scrimmage. The White defense forced three turnovers as defensive back Rasheen Lemon and linebacker Ryan Gorrell intercepted Lynch, while Jason Meehan recovered a fumble. 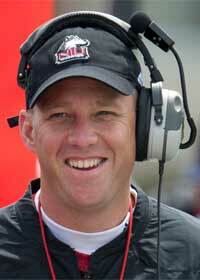 The Spring Game wrapped up spring football for the Huskies as NIU worked out 15 times between March 25 and April 21. 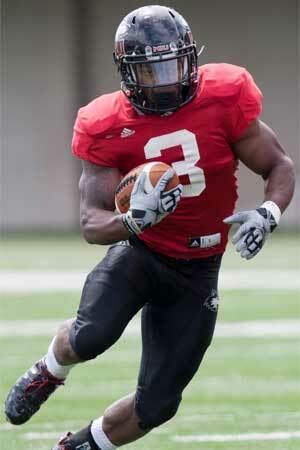 NIU returned three starters on offense and 10 on defense off last season’s MAC Championship squad. Doeren said overall he was pleased with what Northern Illinois accomplished during spring drills. “I think for the most part we accomplished what we wanted this spring,” Doeren said. NIU takes the nation’s longest Football Bowl Subdivision (FBS) winning streak into the 2012 season-opener when the Huskies play host to Iowa at Chicago’s Soldier Field on Sept. 1.